Best Tabouleh recipe — truly! Made even more delicious and nutritious by the substitution of Quinoa instead of cous cous or Bulgar wheat. Quinoa has become highly appreciated for its nutritional value. Its protein content is very high, providing 12-18% of your daily required amount in a 100 gram serving. Unlike wheat or rice (but like oats) quinoa contains a balanced set of essential amino acids for humans, making it an unusually complete protien source among plant foods. It is a good source of dietary fiber and phosphorus and is high in magnesium and iron. Quinoa is gluten-free and considered easy to digest. What we love: The combined health benefits of Parsley, Lemons, and Quinoa leave you with a nutritionally rich salad, providing more of your B vitamins (B1, 2, 3, 5, 6, and 9) than can be found in most dishes.This salad is fresh, filling and full of complex textures and flavours. It keeps for 2-3 days in the fridge so make extra! What we love less: This salad is traditionally made with cous cous which is a pasta. Not the best health choice. However, made with Quinoa there is nothing not to love! Put the cooked Quinoa into a large salad bowl. Dice all of the veggies and add them to the bowl. Add the dressing — you can either pour each dressing ingredient over the salad and mix or mix them all beforehand and pour them on. Try adding a touch of chopped fresh mint or cilantro for a more complex flavour. 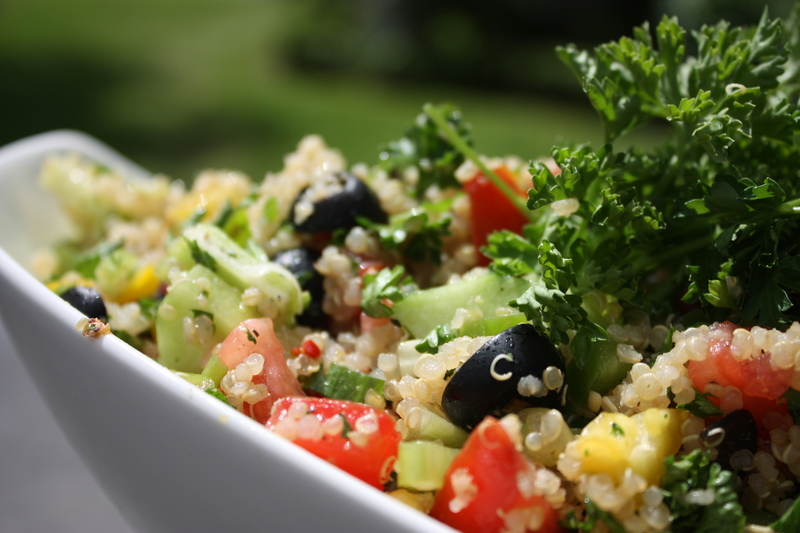 Key: keep in mind that great Tabouleh means that the amount of veggies exceed the amount of grain! In our house we have two main loves, eating, and reading! Hence two blogs to cover them both. The Fresh Svelte Kitchen is a collection of vegan, mostly raw recipes that we love and want to share. G's Top Shelf is an archive of our favourite children's books that grows with 4 year old G as we read more and as his book preferences change. This entry was posted in Salad and tagged complete protien, quinoa, raw, salad, vegan, vegetarian. Bookmark the permalink.